On Apr 9, BTS release full track list of new album ‘Map Of The Soul: Persona’ through official channel. According to the track list, ‘Map Of The Soul: Persona’ consists of a total number of 7 tracks, starting from ‘Intro: Persona’ which has been revealed earlier through video, following title song ‘Boy With Luv feat. Halsey’, ‘Mikrokosmos’, ‘Make It Right’, ‘HOME’, ‘Jamais Vu’ and ‘Dionysus’. 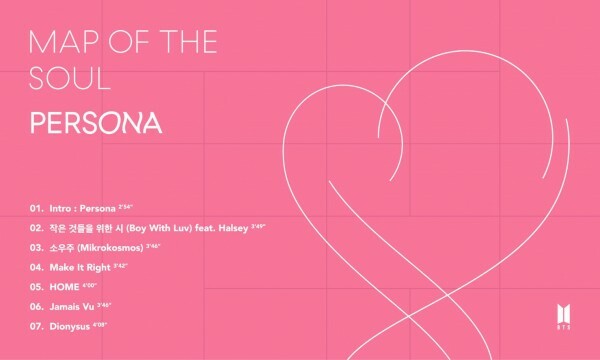 Especially title song ‘Boy With Luv’ in which American singer Halsey featured in makes fans anticipated to the release of the song.